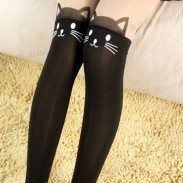 Warm Turnup Cable-Knit Long Cotton Stockings, the most popular mix fold wear stockings, ultra-popular magazine article. Warm Turnup Cable-Knit Long Cotton Stockings, the most popular mix fold wear stockings, ultra-popular magazine article. Beautiful vintage cable knitting pattern, lengthening the leg cuff design, very layered. Lengthen the leg tightening at the overall, long-legged girl can wear, very thin. Socks can be turned down, matching with snow boots, martin boots is super cool. Can be stretched to two-thirds of the thigh length, longer than normal knee socks. That is not very tight, soft comfortable, very suitable to wear stacked pile down in boots mouth, loosely piled on knees. Love this Turnup Long Cotton Stockings? Don't miss it! Love it!! Very pretty! Fashion!